This CellML model has been built with the differential expressions in Rong and Perelson's 2009 paper for the initial basic model of latent cell activation using the (1) equations (rong_2009a). This file is known to run in OpenCell and COR, the units have been checked and they are consistent, and the parameter values of the CellML model were taken from Table 1 in the paper. For these values the critical efficacy = 0.5208 so efficacy has been set to 0.4. Unfortunately the simulation output of this CellML model cannot be fully verified as there are no figures in the published paper for the initial model (equations (1)). 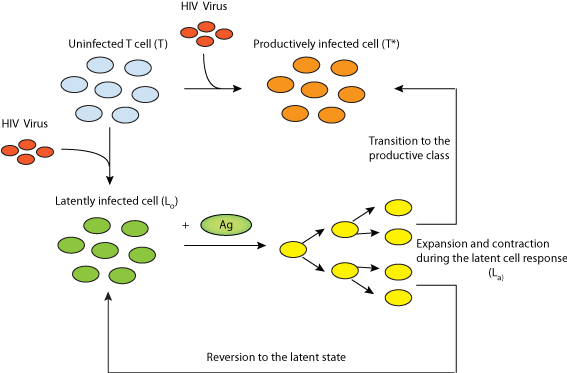 Schematic representation of the model with latently infected cell activation.